Windows 7 and Vista Sidebar SNMP Gadget draws traffic graph of device port via SNMP protocol. It uses the IF-MIB:: ifOutOctets/ifInOctets OID for drawing graphics. This SNMP tool will help you to easily monitor the load on your network devices. 2. Now the gadget is not an error if the device has no OID interface speed. 3. Fixed a few minor bugs. 1. + New user interface settings with easy expansion. 2. + You can now change the UI theme. 5. * Fixed some wrong choice ifIndex on the device. 6. * Fixed and modified many minor bugs. 1. Fixed a bug with saving settings. For example, some users lost dot delimiter in IP address. 2. Fixed some bugs with memory leaks. 3. Small cosmetic fixes interfaces. 4. 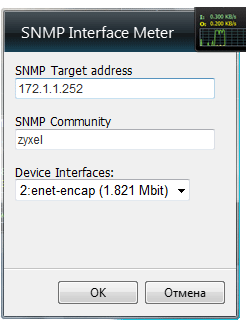 Redesigned SNMP Engine now uses its own SNMP library and "SNMP WMI Provider" Component is no longer needed. 5. And other some small fixes. Please make a donation to help me make this gadget better. Thank You! Send any questions and suggestions to info@netdogware.com.